Madrid, Aug 18 (IANS) Atletico Madrid’s Argentine coach Diego Simeone on Friday said the Spanish football club was starting the new season with enthusiasm, excitement and humility. 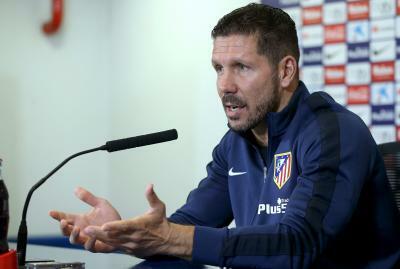 Simeone addressed a press conference prior to Atletico’s upcoming La Liga debut against Girona on Saturday, reports Efe. “We are about to begin a new tournament with enthusiasm, excitement, humility, keen to do things well,” Simeone said. Talking about the situation of the club, which cannot reinforce its squad this transfer window due to a FIFA ban that prevents Atletico from registering new players until January 2018, he praised the effort made to keep the current roster of players. “Surely the club has made an enormous effort to be able to keep important players. The fact that football players who can make a difference have stayed, speaks volumes of the good work that the club is doing,” he added. Simeone said that his squad had to have “the same humility as Girona, the same enthusiasm as Girona, the same passion as Girona”, a team that will take part in La Liga for the first time in its 87-year history after being promoted from the Spanish second division.